Weyers Cave is absolutely filled with gorgeous trees that might need just a little bit of help to really shine the way that they need to. As a home or business owner, your property reflects upon you, and a lot of what people will see in your yard relates to your trees. At Staunton Tree Service, we know that regular maintenance on your trees can be expensive and take a lot of time. We actively work to reduce the amount of money and time you have to spend with us by not only doing preventative work, but also ensuring that our staff is trained and knowledgeable about everything. Give us a call today if you need any of the following services for your trees, or give us a call to see what we can help you with. Use the form below to request a free estimate on your tree service needs in Weyers Cave, VA. Trees that are dead or dying pose a great threat to your home and yard. They can fall if a severe storm hits, easily hitting your home, car, pool, another tree, or your neighbor’s house. If they are sick, it isn’t unheard of for diseases and pests to spread from one tree to another, eventually taking whole yards. Tree removal is fairly straightforward: we come up with a plan to bring the tree down so that everything is safe and then we execute it. However, this can only be done by a professional, as we know all of the weird things that can happen. Many homeowners think that after doing some reading about tree trimming and pruning, they will be able to do it easily. While on some trees that might be the case, on others it can potentially kill them. Tree trimming is a precise art that requires a lot of knowledge and studying. While you might like the look of your tree once you have trimmed it, when the leaves start turning colors and falling off, then you will know you have done something wrong. Professionals know when, how, where, and even why to make specific cuts. They not only make your tree look better now, but they continue that beauty for years to come. For fruit trees, cutting can even give you more fruit! Staunton Tree Service is fully insured and knowledgeable about when and where to make cuts that improve your tree. Once you’ve had a tree removed, there is typically a stump left over. While many people don’t see the need to get rid of the stump, there are a few reasons why you might want to do so. Leftover stumps can get in the way of maintenance to your yard, they can get diseases, they welcome pests to make homes in their softer wood, and can even steal nutrients from the rest of your plants. At Staunton Tree Service, we have the machines and tools to effectively rid your yard of the stump, returning it to a flat surface that won’t negatively impact anything. Give us a call today and we can give you a free estimate for removing any tree stumps you have. Homeowners don’t spend a lot of time thinking about the health of their trees because typically the really isn’t a lot to really worry about – or so you think. There are a lot of hidden dangers lurking in your trees that you wouldn’t necessarily be able to spot. We inspect your trees for any of these problems and come up with ways to help solve the problem. From there, you are given peace of mind that you won’t have to spend a ton of money down the line. Once a storm hits Weyers Cave, there can be a lot of cleanup. Often, that cleanup revolves around larger tree pieces – including whole trees, branches, and root systems. This can be dangerous, and a lot of the time people go about it all wrong. They chop up trees they could have saved, think trees are fine when in reality one more storm can bring them down, and even touch trees that aren’t safe. Don’t put your life at risk – let us help you with storm damage cleanup in Weyers Cave. Weyers Cave is a small town, but that doesn’t mean you need small town care. 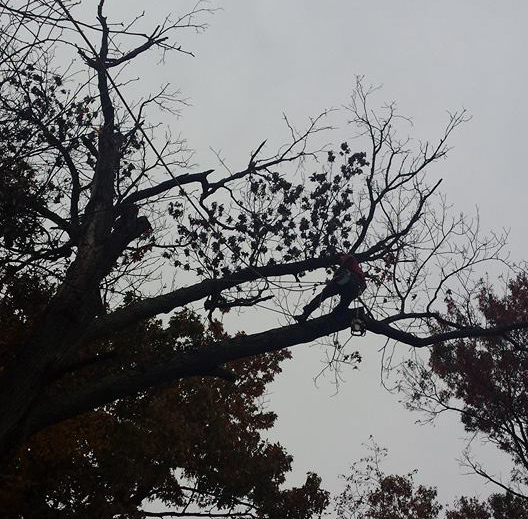 At Staunton Tree Service, we have the tools, insurance, and knowledge required to help you out with any tree. We also help with business and commercial properties.